Abigail (JP), Draconis Infernum and Nuclear Revenge join Old Grave Fest! Rumor has it that there would have been seven instead of the four Ninja Turtles, but three of them ended up as stains on the wall of a Yakuza brothel toilet. They oozed and dripped and developed into permanent secretions until the merciful ladies found and raised them as only they could: drink, drugs, women, and rock’n ‘roll. Of course, all this is just a long-forgotten urban legend, but like any myth, it has a kernel of truth: the three members of Abigail that inspired it. And rightly so! 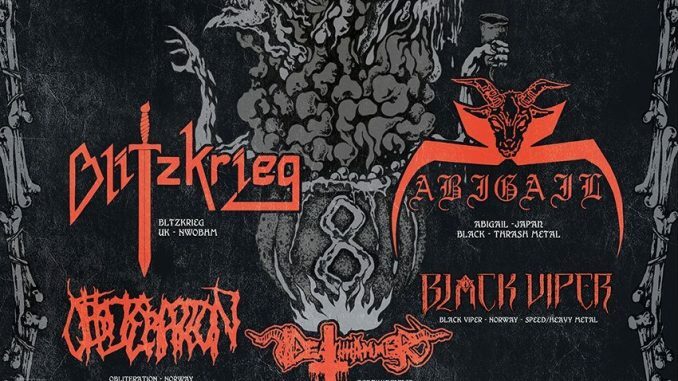 Founded in 1992 in Tokyo, Abigail, simply labeled black/thrash metal, has accumulated, up to 2019, a number of releases that would cause at least half of the world’s grindcore scene to go weak in the knees only halfway through the list. Going beyond bookkeeping, we must admit that the music also conforms to the myth. Or how else would you call a compost made of the most miserable and abominable punk and metal? It’s the kind of band that even the guys in Impaled Nazarene would stare in disgust at! Throughout this era of decadence and depravity, however, from the very beginning up to the present, we can identify one constant: the influence of Motorhead. Be it straight Motorhead, Motorhead and black metal, Motorhead and any other heavy metal species (no, not punk, why do you ask? ), Motorhead and Slayer, Darkthrone or the Spice Girls, it does not matter, these guys put Motorhead in sushi, true story. To conclude, unanimously, we have to say that Abigail were not born like regular people, but rather scraped off a surface that’s lethal, at minimum contact, for the rest of humanity. Just look at the collaborations of the three band members with entities spawned from the same gutter: Metalucifer, Barbatos, Cut Throat, Magnesium, Sigh, Gorgon and, of course, Sabbat. All this will add up to one hour of total mayhem on the stage of Old Grave Fest 8. You can’t refuse that. What kind of human being would you be?! Draconis Infernum join Abigail as the other Asian addition to the fest. Hailing from Singapore, they started life as a traditional Norwegian influenced black metal band and, in time, expanded their sound, adding atmospheric touches in the vein of Finnish bands such as Horna or Sargeist, rhythmic, ritualistic passages reminiscent of Inquisition, and some classic Marduk aggression for good measure. Formed in 2005, and with three full-lengths under their belt already, the band will kick off their European autumn tour in Bucharest. It’s not all Asian update this time though, let’s head back to Europe and discover a promising newcomer. If you like your thrash metal fast, gritty and blackened, look no forward. The Spaniards Nuclear Revenge just released their debut album Let the Tyrants Rise last year and are eager to bring all that fury onstage at OGF. Fans of early Kreator/Sodom should be in for a treat. OLD GRAVE FEST 8, 11-12 October 2019, club Fabrica, Bucharest. Get you early bird tickets for 135 RON / 30 EUR here:http://www.rtmc.ro/tickets/ and iabilet.ro!